This is a 100% cotton, pre-shrunk, red t-shirt featuring the phrase “I’m a Skin Job”, referring to the human like cylons, from the new hit sci-fi TV series Battlestar Galactica. 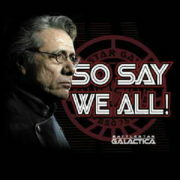 This is a 100% cotton, pre-shrunk, black t-shirt featuring the image of Admiral Adama beside the BSG Phoenix logo and the phrase “So Say We All!”, from the new hit sci-fi TV series Battlestar Galactica. 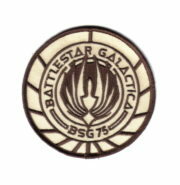 This is the full size shoulder logo patch of the new hit TV show Battlestar Galactica as worn by the bridge crew. 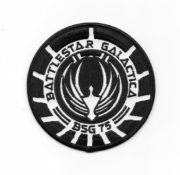 This is the full size shoulder logo patch of the new hit TV show Battlestar Galactica. This is the tactical OD green version. It is a new, mint, embroidered patch, measuring 4″ across. 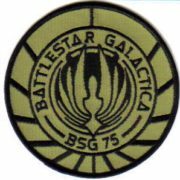 This is the logo shoulder patch of the new hit TV show Battlestar Galactica, as worn by the Marines, black squad version. It is a new, mint, embroidered patch, measuring 4″ across. 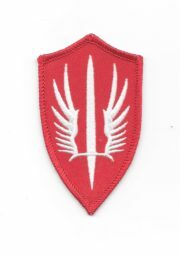 This is the logo shoulder patch of the new hit TV show Battlestar Galactica, as worn by the Marines special ops division. These are a screen accurate deluxe reproduction pair of highly detailed Captain collar rank pips, as seen on the hit sci-fi TV series Battlestar Galactica. These are made of a heavy cast copper and nickel metal alloy in a gold and silver tone finish, measuring 1.125″ high. The edge of the pin is gold tone and the two rank bars are in silver tone. These are a screen accurate deluxe reproduction pair of highly detailed Colonel collar rank pips, as seen on the hit sci-fi TV series Battlestar Galactica. These are made of a heavy cast copper and nickel metal alloy in a gold and silver tone finish, measuring 1.125″ high. The edge of the pin is gold tone and the bar running along the edge is in silver tone. This is a screen accurate deluxe reproduction of the senior officers wings, as seen on the recent hit sci-fi TV series Battlestar Galactica. These are worn by Adama and other senior officers. It is made of a heavy cast cloisonne copper and nickel metal alloy in a gold and silver tone finish and measures 2.688″ wide. This is not like the thin cheaply made pins offered by some other sellers or overpriced as some are doing for the same pins. They are stored in a smoke and pet free environment. 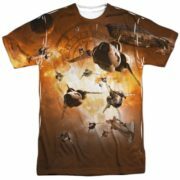 This is a double sided sublimation print t-shirt that displays the photo image of various spacecrafts from the sci-fi TV series Battlestar Galactica. Each t-shirt is hand made and unique. This is a new, unused, 100% pre-shrunk polyester t-shirt, available from us in sizes small, medium, and xl.You may choose the size you desire otherwise we will ship size xl. These are a screen accurate deluxe reproduction pair of highly detailed Ensign collar rank pips, as seen on the hit sci-fi TV series Battlestar Galactica. These are made of a heavy cast copper and nickel metal alloy in a gold and silver tone finish, measuring 1.125″ high. The edge of the pin is silver tone and the interior in a flat gold tone. 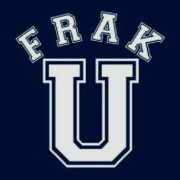 This is a 100% cotton, pre-shrunk, dark navy blue t-shirt featuring the words FRAK U in a college logo, from the new hit sci-fi TV series Battlestar Galactica. 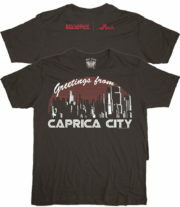 This is a 100% cotton, pre-shrunk, black t-shirt featuring a city skyline surrounded by the words “Greetings from CAPRICA CITY” on the front, from the new hit sci-fi TV series Battlestar Galactica. The back has the series title and sci-fi near the collar. 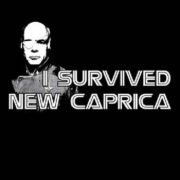 This is a 100% cotton, pre-shrunk, black t-shirt featuring the image of Colonel Tigh beside the phrase “I Survived New Caprica”, from the new hit sci-fi TV series Battlestar Galactica. 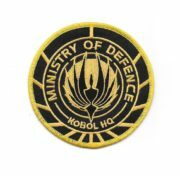 This is the shoulder logo patch of the Ministry of Defence, Kobol Headquarters as seen on the uniform of Kendra Shaw in new hit TV show Battlestar Galactica movie Razor. These are a screen accurate deluxe reproduction pair of highly detailed Lieutenant, JG. collar rank pips, as seen on the hit sci-fi TV series Battlestar Galactica. These are made of a heavy cast copper and nickel metal alloy in a gold and silver tone finish, measuring 1.125″ high. The edge of the pin is silver tone and the interior in a flat gold tone. These are a screen accurate deluxe reproduction pair of highly detailed Major collar rank pips, as seen on the hit sci-fi TV series Battlestar Galactica. 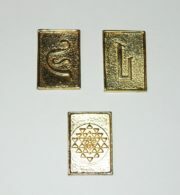 These are made of a heavy cast copper and nickel metal alloy in a gold and silver tone finish, measuring 1 1/4″ high. The edge of the pin is gold tone and the three rank bars are in silver tone. 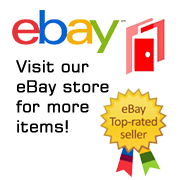 They are not the thin cheaply made pins offered by some other sellers or overpriced as some are doing for the same pins. 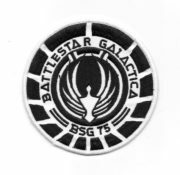 This is the patch worn on the shoulder of the crew members of the Battlestar Pegasus on the original hit TV series Battlestar Galactica. This was the ship that was commanded by Lloyd Bridges and from whom Sheba transferred from to the Galactica. It is a new, mint, embroidered patch, measuring 3 1/2″ high. This is a cloth baseball style hat with a mesh back with the Battlestar Galactica Original Series Pegasus logo patch attached to the front. This is a new, never worn hat, available in either blue or black. If you do not choose we will send our choice. 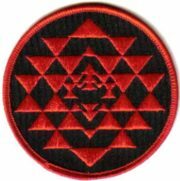 This is the patch worn on the shoulder of the Red Squadron Viper pilots jackets on the original hit TV series Battlestar Galactica. This is a cloth baseball style hat with a mesh back with the Battlestar Galactica Original Series shoulder patch attached to the front. This is a new, never worn hat, available in either blue or black. If you do not choose we will send our choice. 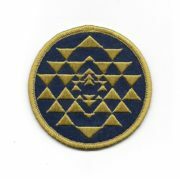 This is the patch worn on the shoulder of the Viper pilots jackets on the original hit TV series Battlestar Galactica. These are a reproduction pair of cubits as seen on the original hit sci-fi TV series Battlestar Galactica. They were also seen briefly in the recent Sci-Fi channel mini series. There are two versions. The third one in the picture is the back side of each, which has the same design as the shoulder patch they wore. 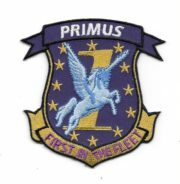 This is the full size chest logo patch of 1st Fighter Squadron Primus on the Galactica from the recent hit TV show Battlestar Galactica. It is a new, mint, embroidered patch, measuring 3″ high.